Outdoors in Summer. Here in the East, where summers are hot and humid, I find peltatum performs best not in full sun all day, but in a bright location that receives only morning sun. My plant blooms and blooms at the northeast exposure beside my back door. I feed it with every watering, just as I do all my container-grown plants. On a low-nitrogen, high-phosphorous diet its stems reach Rapanzel length, often 4-feet, by August. What a sight! Indoors in Winter. This South African traveler will pay great dividends in exchange for winter care indoors. Before the first frost — October first for me — cut its stems back to six inches, and spray pot, soil, and foliage with insecticide. Then place the plant somewhere sunny but cool (60F is better than 70F). My plant goes on a shelf beneath fluorescent lights in my cool study. If you have a cool south or east window, set your plant there. Knock the plant from its pot, and slice off half the root ball (above). Snip off half the foliage, too. Then add an inch or so of well-draining compost to the same pot, and reset the plant, filling in with more compost (below). Be sure to leave a two-inch opening between the top of the compost and the rim of the pot to allow for water. Moisten well, then return the plant to its sunny, cool quarters. You will see an immediate improvement in your basket-plant’s appearance. Propagation: To avoid the need for surgery and its associated messiness, overwinter the plant by propagating a few cuttings. You can take cuttings at any time of year. Cut healthy stems five to eight inches in length. Cut just below a node. Remove the lower inch or so of leaves. Insert stems in a pot of well-draining compost, as above. Firm the compost to secure each stem in place. A five inch pot will comfortably hold three stems for the winter duration. Water well, and thereafter only when the surface soil feels dry. Place the cuttings in a bright location for 3 weeks while they grow roots. Then bring them to sunny south or east window. You can count on autumn-rooted cuttings to bloom from February on. 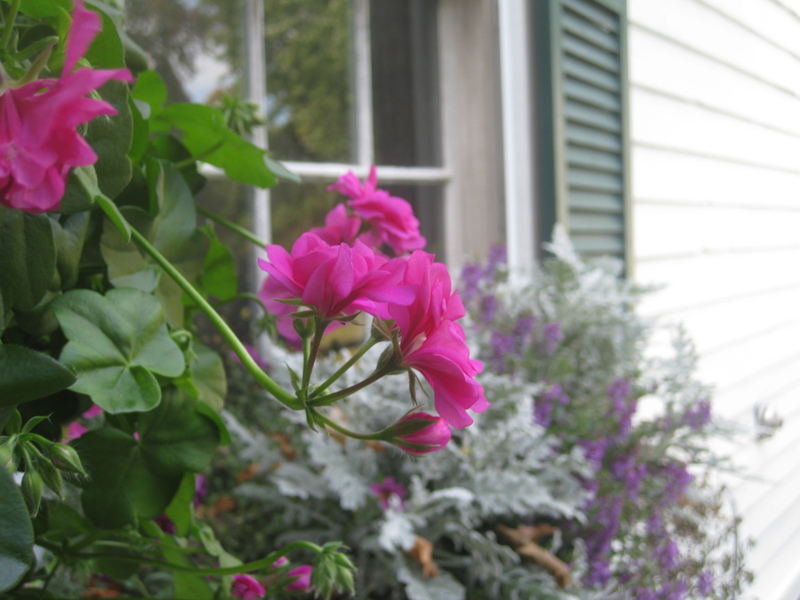 Transplant to a hanging basket (or window box) when summer arrives. 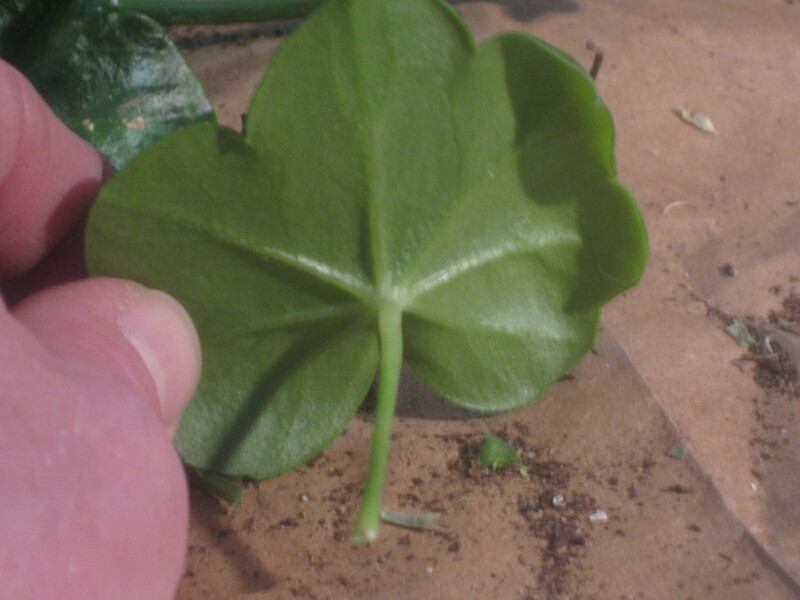 The ivy geranium received its common name because its leaf resembles that of the true ivy, Hedera helix. The botanical name, peltatum, means “shield-shaped,” and indeed the leaf’s stem is attached in the center, in the very manner of a warrior holding his shield. 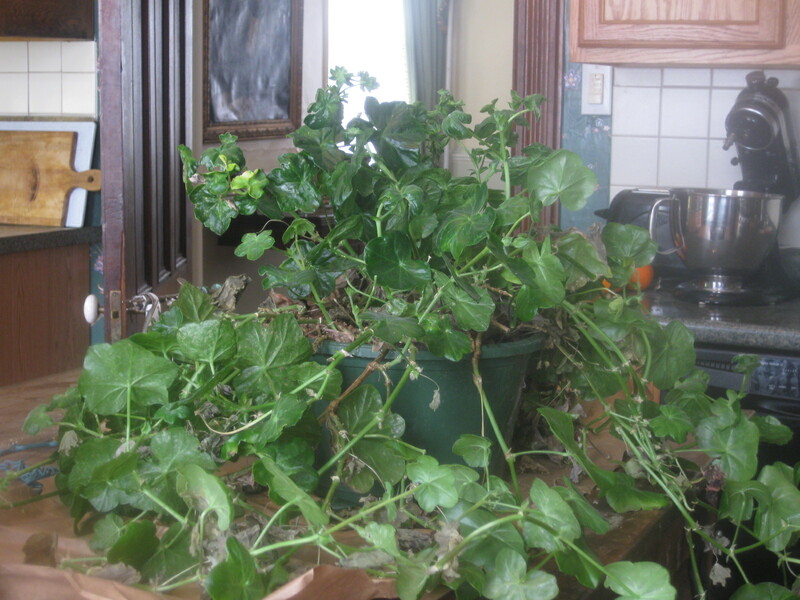 If you like the ivy-leaved geranium, will you do me a big, big favor? Click the Facebook “like” button below. 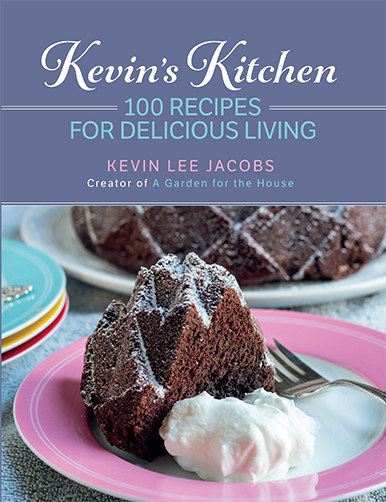 Well, Kevin, if you are going to have an affair with a plant, it might as well be with your Lavender ivy geranium! What a beauty!!! Seems like I bought the very same geranium as you last summer. Unfortunately I didn't know it could be overwintered indoors. Live and learn, as they say. I love the feel of the leaves – they are so thick I want to bite them! Patty – And the leaves, when you broke them, smell like…fresh cucumbers! Here in Colorado, all of the pelargoniums –ivy leaf, scented, regular old bedding plant geraniums—bloom indoors the entire winter. Maybe it's because of our intense sunlight. This time of year they are leggy and I just cut mine back. Love your blog, btw. Diana – nice to meet you! Here in (dark) upstate NY, my zonal-, fancy-, scented- and ivy-leaved pelargoniums bloom only a little during autumn and early winter. They bud and bloom ferociously, however, starting in February. Do you grow any of the fancy-leaveds, like 'Mrs. Henry Cox' or 'Skies of Italy' indoors? I do grow the fancy-leaved ones indoors. This past winter I've had Mrs. Pollock and Vancouver Centennial blooming. 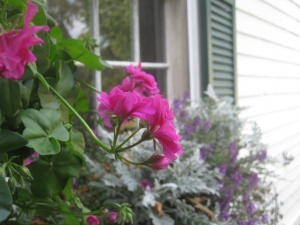 Mrs. Pollock doesn't bloom as well as most of my geraniums, for some reason, but I love the tricolor leaves. V.C. is a smaller plant, but it blooms a lot. I followed your advice and did the operation on several of my geraniums. The thing is that most of them will be flowering by next week! Now it's normally mother's day that we put our geraniums out! 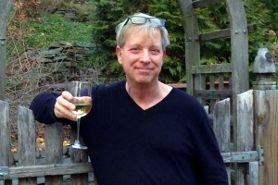 Bob – Good for you! 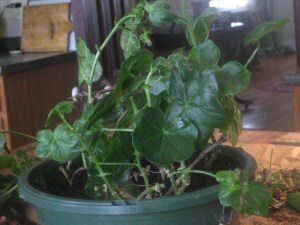 Only gardeners in warm climates should set geraniums out now…the rest of us need to wait until after Mother's Day (when nights are consistently well above freezing). Kevin, Yesterday I fell in love with a Pelargonium called Royal Lilac that I couldn't resist. I had seen the same plant in planters at my hairdresser's last month. She didn't know what it was but I was pretty sure it was a Martha Washington geranium. She told me where she bought it and I went right to that nursery and there was none left. The lady that worked there said she didn't recall seeing any Martha Washington geraniums this Spring. Imagine my surprize when I saw them on the cart yesterday at Home Depot. At $10.98 each, I only bought two plants and I wished I'd bought more. Probably when I go back, they will be all gone. Oh well, such is life! These remind me of a woman's burgundy velvet holiday party dress. I planted both plants in one of my larger pots. Thought of your hanging plant when I saw these. Thanks for sharing all your beautiful photos of your gardens and your vast knowledge of flowers and helpful tips. Your blog is among my favorites! Pippi21 – Some of the Martha Washingtons are truly dazzling — including the one you described here. 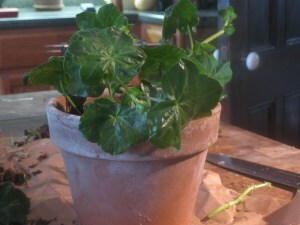 If you want more of these pelargoniums, why not propagate them? 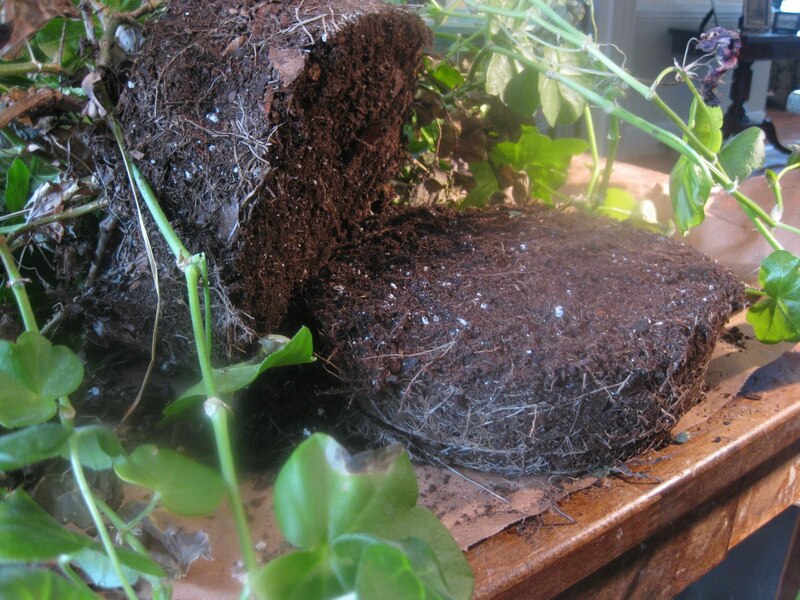 Stems, 3″ in length, root very easily in 4″ pots of good soil. I can tell you that one summer, I propagated a dozen stems of a beautiful pink-splashed-white Martha Washington that a friend had given me. I kept the cuttings in the shade during summer. In September the young plants were set on the glass shelves of my window garden. They bloomed and bloomed from late January through early April. What a sight! 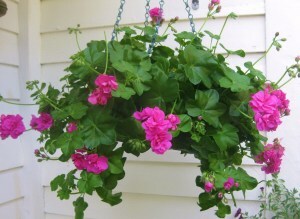 My all-time favorite plant for hanging baskets – thanks for the great detailed info. Mine – 5 – typically get full morning sun then shade but plenty of light in the afternoon on my back porch. I add a few filler plants – can’t recall the name – delicate white flowers with very spidery greenery – just breathtaking – my favorite is a rosy red – 5 baskets in a row – neighbors stop to enjoy them – and coffee in the early morning. Living on a corner lot does have its advantages – my backyard gets noticed a lot. Daffodils and tulips with bring the walkers to my garden gate soon. Thanks for your fabulous information – consider less chemicals in your yard – I use NONE and have very few insect problems. I use all organic compost obtained from local organic farmers. Anyone ever seen ivy leaf geraniums bearing names of famous American universities? Haven’t seen any since the 90s. Exquisite hypnotic deep pink and deep, deep violet single flowers. Very beautiful plant and great tips! It’s really very similar to ivy, but a lot better. I have one like this in my garden, but I don’t bring it inside, because the weather here allows it to stay outdoors all year long. The maintenance tips are very useful, especially about the roots. Thanks for sharing! This plant is a warrior. I found a bare stick of a stump left in a pot and it had one little bud on it and I nursed it and brought it back to a full blown ivy plant that I’ve got tied to and growing up half a trellis. The cuttings I take from it thrive with no issues. I’ve grown 6 clones so far and this plant just keeps on ticking. I didn’t know what it was, there wasn’t a label in the pot so I’ve been searching the internet for “star shaped succulent with 5 flower cluster blooms” which didn’t really help. 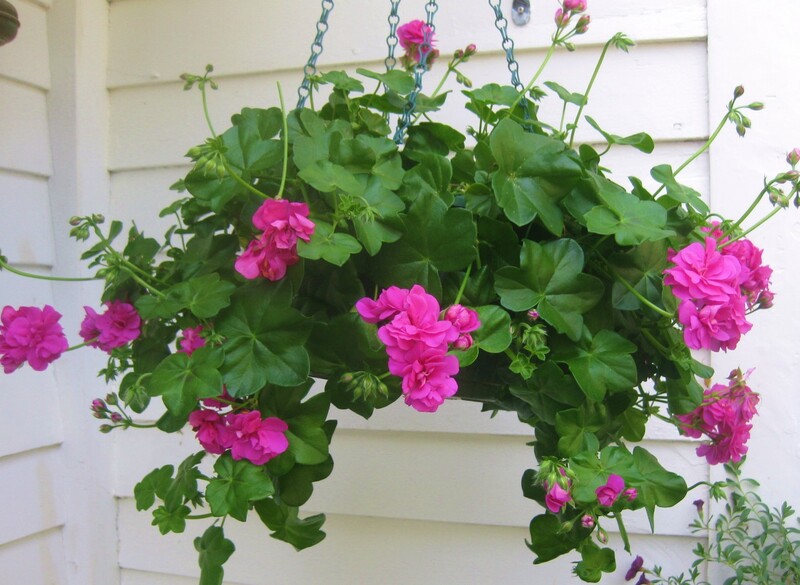 I finally did hanging vine plant pink flowers and luckily came across this blog. I just found your website as I’ve been looking into ivy geraniums and whether I want to use those for my front hanging basket or petunias this summer – judging by that gorgeous picture of your lavender geranium I’m going to try my hand at one. Is that just one plant per basket? I’ve also been reading your other posts about propagating different plant cuttings and I’m gaining courage to try my hand at it this year. I have a baby due this summer, so we’ll see how busy I am, but I’m really hoping to try. Thank you for the clear instructions and clever writing, I’m looking forward to perusing all your gardening posts now! Hi Amanda – Thanks for visiting. Also, congrats on the new baby!